The UN 90-90-90 Targets aim to achieve epidemic control, starting with diagnosing 90% of all people with HIV. But as of 2017, the estimates suggest 25% of people with HIV, more than 9 million people, remain undiagnosed. In eastern and southern Africa where the HIV burden is greatest, it is estimated that 3.7 million people with HIV still do not know their status. While huge investment and a plethora of work have helped improve diagnosis and linkage to care, to achieve the First and Second 90 we need to consider broad and novel approaches to HIV testing. HIV self-testing (HIVST) has provided a discreet and convenient way to test for many who may not have been reached. 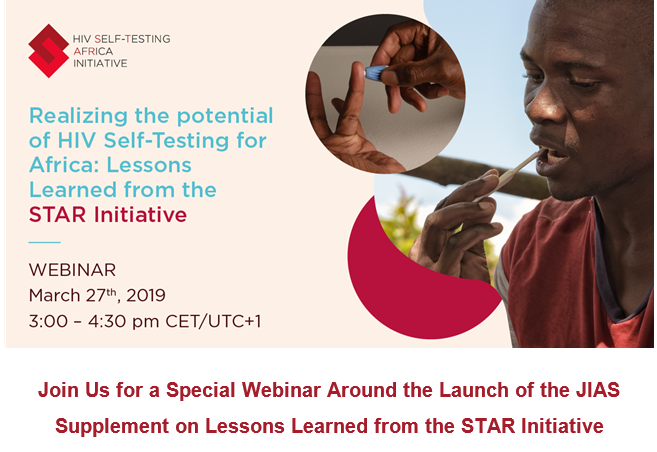 Since 2015, the Unitaid-funded Self-Testing Africa (STAR) Initiative – led by Population Services International in partnership with the London School of Hygiene and Tropical Medicine and WHO – have led the largest evaluation of HIVST. This supplement, coordinated by WHO with STAR Initiative, presents new and key findings and provides clear routes for improved implementation moving forward. 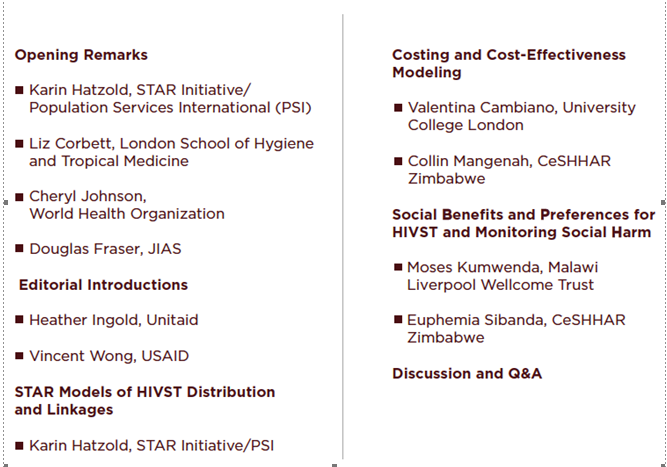 Guided by guest editors Vincent J. Wong (USAID), Nathan Ford (WHO) and Kawango Agot (Impact-RDO), this supplement features 11 high impact articles covering issues relevant to HIVST program design, distribution, linkages, costs, cost-effectiveness, regulation, quality assurance and ethical considerations to inform global scale-up of HIVST.